TSPSC Notification is out. 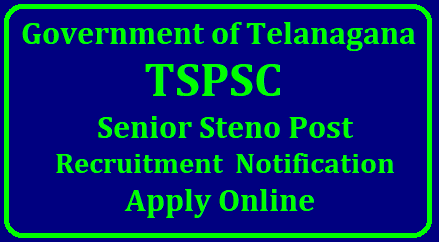 TSPSC is recruiting for 19 Senior Steno Post Posts. You can check TSPSC - Telangana State Public Service Commission last date, download TSPSC notification, visit TSPSC official website and check other TSPSC Vacancy details.Complete Vacancy and recruitment Details about 19 Senior Steno Post vacancies in TSPSC are provided below for you. Last Date for Apply Online 02/07/2018. General / Other State Rs.280/-. SC / ST / OBC of Telangana State Rs.200/-. Mode of Payment Application fees Can be Submitted Online through SBI ePay. Candidate Must Have Passed Graduation and Government Technical Examination in Short hand and Type Writing. Age Relaxation Upper Age Limit is Relaxable by 05 Years for SC / ST / BC / PH Candidates. 2.Click On the Apply Online Link given on Important Link section. 6.Online Application can be Submitted on or Before 02nd July 2018.